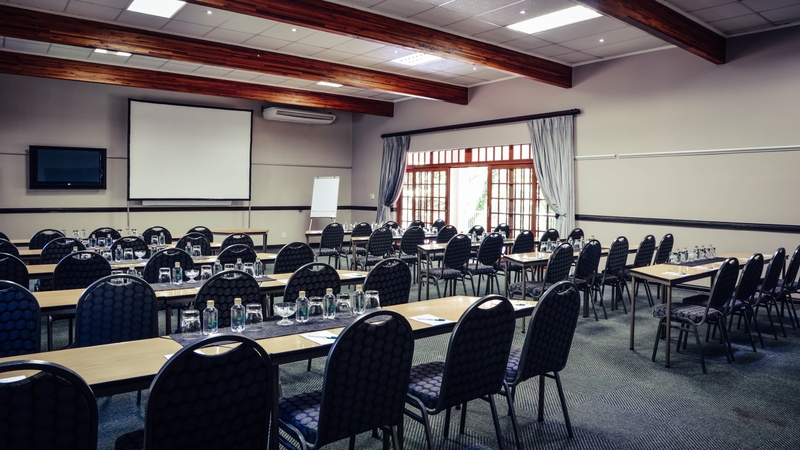 Valley Lodge & Spa’s state-of-the-art meeting and conference facilities are situated in a picturesque country setting. This makes our hotel in Magaliesburg an ideal corporate destination to motivate and inspire. Check out our new conference hall, which is bigger and better among our other conferences venues. This can accommodate a maximum of 400 delegates. Henry Hartley is one of the largest of our conference rooms and is the ideal venue for a conference, launch, or strategy session. This can accommodate up to 120 delegates in cinema-style setting. This venue has a balcony/terrace that overlooks the river and gardens – the perfect spot for your tea breaks. The bathroom facilities are shared with Thomas Baines, which is situated next to this venue. It also has a small parking area, which is ideal for off-loading conference equipment. This is situated next to Henry Hartley and can accommodate up to 70 delegates in cinema-style setup. This venue also has a balcony/terrace that overlooks the river and gardens, which can be utilised for the morning and afternoon breaks. The bathroom facilities are shared with Henry Hartley. This is the larger of the two venues in this area, located next to our tennis courts and comprises of the top level of this conference block. This venue gives you sweeping views of our gardens and easy access to the Meadows, the lawn area utilised for team building. This venue has a large balcony/terrace which can be used for tea breaks as well as an informal breakaway venue (depending on the weather). The bathroom facilities are located downstairs and are shared with Oriole. Oriole is situated downstairs of Sunbird on the ground floor. It has easy access onto the Meadows, the lawn area utilised for team building. The covered terrace overlooking the gardens and lawn is ideal for tea breaks and can be used in conjunction with the lawn area for informal breakaways. The bathroom facilities are located next to the conference venue. This is the smallest of our conference venues and perfect for small board meetings or strategy sessions. Kingfisher is located close to the restaurant area and overlooks Maloney’s Terrace, where tea breaks are set up. The bathroom facilities are also located close to the venue. Valley Lodge & Spa’s experienced coordinators can assist in planning your business event with flawless efficiency.